Incumbent Mayor of Chicago Rahm Emanuel’s recent announcement that he will not seek re-election for a third term (the election is in February 2019, with a possible run-off in April) was an earthquake that shook the city’s political landscape. Despite fairly low approval ratings, Emanuel was still the front-runner in a field in which none of the dozen declared challengers had been elected to major office. Since the announcement, many prominent Chicago pols have explored their options, and the pool of candidates is almost certain to change before the November 26 filing deadline. Chicago’s politics sit at a crossroads, as a relatively progressive and prosperous metropolis in a region where urban crisis and creeping conservative drift have been more common lately. This scenario has also been complicated by continued demographic change, including significant decline in the black population while other ethnic and racial groups continue to grow, and an ever-expanding swath of gentrifying areas around the Loop. Here are three things to keep in mind as the dust settles. Emanuel was shaping everything about this race, and his influence could continue even without his name on the ballot. Emanuel’s influence until now worked in two ways. First, Emanuel had effectively deterred most of the strongest potential challengers—prominent office-holders, the leaders of political organizations, very wealthy individuals—from entering the race. Second, most of the candidates who had declared were largely running on a strategy to edge out their rivals in the divided general election field by voicing loud dissatisfaction with the status quo, and then unite anti-incumbent sentiment to face Emanuel in a run-off. Without the incumbent foil, it isn’t clear what issues will rise to the center of the debates, or how votes will allocate across the candidate field as it develops. However, without specific concrete policy proposals to deal with such matters as Chicago’s chronic violence, impending school closures and the pension crisis, candidates may struggle to persuade in an anti-establishment moment. On the other hand, high-profile endorsements and campaign cash are necessary for boosting name recognition in an electorate of more than a million voters. 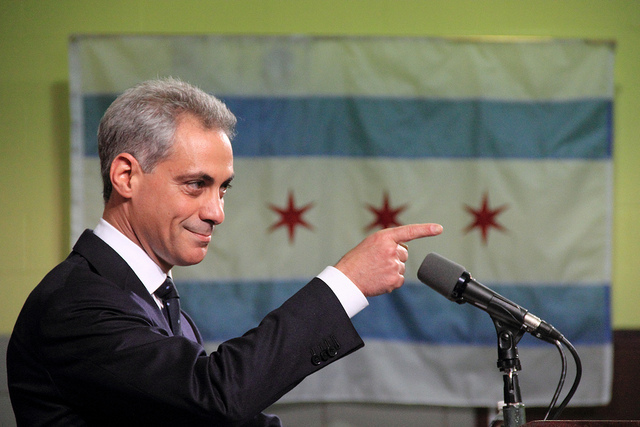 After announcing his withdrawal, Emanuel remarked that “the next leader of Chicago” was not yet in the race. Since then, several high-profile candidates have entered or publicly explored such a move. Even among these better-established candidates and even without Emanuel in the race, behind-closed-doors conversations seem to be shaping decisions to run. One way that Emanuel could shape whether his “next leader” comment is right is by throwing support behind a would-be successor. He had already raised far more in campaign contributions than the rest of the field combined, and a candidate who inherits that wealth would gain an edge against the underfunded, less well-known rivals. On the other hand, that candidate would have to balance his blessing with the baggage that might come with it in pursuit of support from the same heterogeneous constituencies that chased him from the race in the first place. Chicago’s social geography is still reflected in its voting patterns. By “heterogeneous constituencies,” we mean the durable and plural social bases of Chicago politics, residuals of 20th century segregation that are still reflected in the city’s geography. Socially, we have several Chicago’s developing in divergent ways: a growing and politically restless collection of predominantly Latinx communities on the Northwest and Southwest sides; large areas of the predominantly black South and West sides, which are losing population and face chronic deprivation; the prosperous and expanding central area that includes the downtown Loop and adjacent gentrifying areas; and a relatively stable and conservative, mostly white, North side. (Of course this model of the city is simplified). In the 1980s elections in which Harold Washington won and defended the mayoralty, racial voting polarization was extreme. This pattern weakened gradually over the Richard M. Daley years, until he eventually re-incorporated the South and West sides into his electoral coalition and won all wards in 2007. In recent cycles racial voting has been less stark, but still real–local demography is still associated with candidate identity, but that association is much weaker and is also clearly tied to policy issues–and it would be very difficult to win without appealing to more than one of these Chicagos. Emanuel won majorities in three of these areas, leading to fairly comfortable victories each time, but his trajectory was the opposite of Daley’s, however—he got weaker almost everywhere in 2015, and these losses were concentrated among black Chicagoans. The Laquan Macdonald shooting continues to draw massive attention, in part because the release of information seemed suspiciously timed to aid Emanuel’s electoral prospects; the ongoing trial of the officer involved will not help. However, Emanuel’s support on much of the South and West sides was already fairly thin before those headlines. His main opposition (led by the Chicago Teacher’s Union) was galvanized in part by Emanuel’s decision to embark on the biggest wave of school closings in any city in American history during his first term. These closures were concentrated on the South and West Sides, and my research with Sally Nuamah (here and here) that the largely black communities affected by these closures turned against Emanuel more than other areas of the city in his re-election (See figure 1). Chicago Public Schools has basically continued this policy; Emanuel’s support among black Chicagoans would almost surely have plummeted further this time around. There was also witnessed a gradual decline in Latino support for the mayor. Several Emanuel-backed Latino incumbents were defeated in 2015 by progressive newcomers. The mayor responded to these setbacks by advocating for and supporting such measures as the Welcoming City Ordinance, establishing the Office of New Americans, preventing school closures as well as shoring up alliances with prominent Latino/a elected officials such as Congressman Luis Gutierrez and State Comptroller Susana Mendoza, who might themselves serve as power brokers or heirs apparent in 2019. Figure 1: School Closures and Change in Voter Support for Rahm Emanuel, 2011-2015. Areas depicted are Community Areas, shaded by the change in support for Emanuel (percent 2015 minus percent 2011). Triangles indicate location of closed schools. A candidate who could unite Latinx voters—who constitute a smaller share of the electorate than of the population because of age and immigration status, but who have proven to be a significant electoral bloc in recent cycles—or Chicago’s black communities would be an immediate contender. A candidate who could construct and mobilize a cohesive “black and brown” or rainbow coalition, as Washington did in the 1980s and activists are trying to do today, would be an immediate frontrunner. On the other hand, a three-way race featuring well-established (and frequent Emanuel collaborators in government) from each ethnoracial/geographic group reverts to unpredictability. The down-ballot races for city council may be where the real change occurs. For most of the 20th century, our city was run by a famously hegemonic Democratic party organization. The legacy of party dominance endured into the nominally non-partisan 21st century—Democratic presidential and gubernatorial candidates have won 99.7% of city wards over the last 3 cycles; Richard M. Daley won every ward and more than 98% of precincts in his last campaign for re-election; and until very recently, city council votes have almost always been unanimous or extremely lopsided. Both formal and informal institutions within the city’s politics supported this centralization of power. To some extent this executive-centered politics makes sense, from the election through to governing. The expense of running a citywide campaign, and the hefty urgent, challenges associated with the office—defending Chicago’s governance prerogatives against state and federal interference, managing perennial fiscal crises, reforming policing and other city services to be more just and responsive, responding to restive activists, attracting outside investment to maintain Chicago’s position in the wider system of cities, all while doing the housekeeping that such a big place requires—make the job one for a figure who can muster political will and coalitions to get things done and avoid the chaos that can emerge from hyperpluralism. But in recent years, a narrative framing Chicago politics as a contest between neoliberal management and local democracy has gained traction (the older narratives of ethnoracial rivalry/succession and machine vs. reformers persist). For more than a decade, the Daley and Emanuel administrations emphasized downtown growth, the assumed preferability of privatized services, and boosting Chicago’s place in the global and national systems of cities as a way to enhance growth and avoid the deep dysfunction of other cities in the region (Chicago aspires to be New York, but it’s still worried about becoming Detroit). Paradoxically, the city’s relative success itself creates new tensions and cleavages: the global-city approach may help an abstract Chicago more than it helps most actual Chicagoans. The neighborhood-centric approach advocated by Emanuel’s main critics (including his opponent in 2015) focuses more on grassroots responsiveness, a reinvigoration of movement-style democratic mobilization, and using policy to soften the rough edges of capitalism rather than sharpen them. As in some other big cities, a coalition of progressive activists and organized labor leaders has powered a growing local opposition that sits somewhere on the fence between party faction and autonomous outsider movement. In the last two cycles, a relatively oppositional “Progressive Caucus” of aldermen have run against Emanuel’s favored candidates and been able to score some victories, and they now make up about 11 of the 50 seats in the city council. The coalition associated with this group also defeated controversial organization-supported candidates in medium-profile but substantively important races for State’s Attorney and Assessor, both weakening the central organization and demonstrating the outsiders’ ability to organize for city-wide elections. Significantly, this caucus does not really correlate with either support for Emanuel’s previous opponents or a particular geographical-social-racial group; it appears to be largely an autonomous coalition of issue-driven legislators pushing against centralized and business-first policymaking: more democratic schools policy, affordable housing measures, and police reform are some of the main policies that the group has used to focus attention on how government affects the lives of everyday Chicagoans. It seems likely that this bloc will grow without Emanuel’s presence to support his preferred incumbents: while many of Chicago’s 50 alderman frequently run unopposed, so far more than 100 candidates have declared, including challenges to some of the more longstanding members of the council. If that occurs, we may enter a new era of Chicago politics, characterized less by a dominant center and more by a factious and shifting terrain of coalitions. With Emanuel gone, the only electoral certainty in the race to replace him is uncertainty, and the “next leader” of the city that Emanuel predicted may in fact be more accurately described as the next leaders of Chicago. Thomas Ogorzalek is Assistant Professor of Political Science and Urban Studies at Northwestern University, and Co-Director of the Chicago Democracy Project. He is the author of The Cities on the Hill: How Urban Institutions Transformed American Politics (Oxford University Press, 2018), and serves on the Urban Affairs Review editorial board. Jaime Domínguez, Ph.D., is an Assistant Professor of Instruction in the Department of Political Science at Northwestern University with research and teaching interests in the areas of American politics including immigration, race and ethnicity, urban and Chicago politics. He is co-director of the Chicago Democracy Project and a recipient of the Public Voices Fellowship. He is a frequent commentator for local and major news outlets including PBS, NPR, Telemundo, Univision and the Chicago Tribune. He is also affiliated with the Latino/a Studies Program and the Center for the Study of Diversity and Democracy at Northwestern University.